Emphasizes security but at the expense of automation. AgileBits 1Password was originally designed for the Mac way back in 2006. 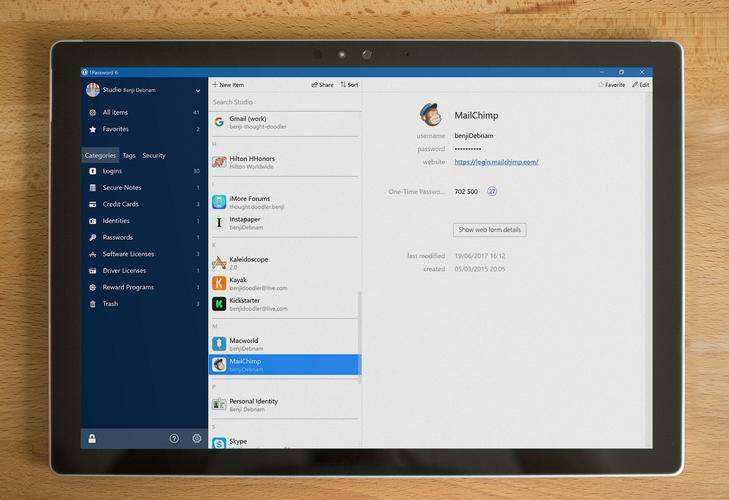 But today it also offers apps for Windows, Android, and iOS as well as extensions for all major browsers. It boasts some of the same features as top-tier managers LastPass and Dashlane, but lacks some key ones and overall feels a lot less polished. 1Password has a unique setup process. After entering your name, 1Password generates a 34-character “secret key.” Next you create your master password. Together, these two pieces create the full-encryption key used to encrypt your passwords and other data and you’ll need to enter them both each time you add a new device or browser extension. Given their importance, 1Password next offers to create an Emergency Kit that contains your secret key and a space to write in your master password. It saves it as a PDF, and you’re advised to store it on a USB key or in a safe deposit box. 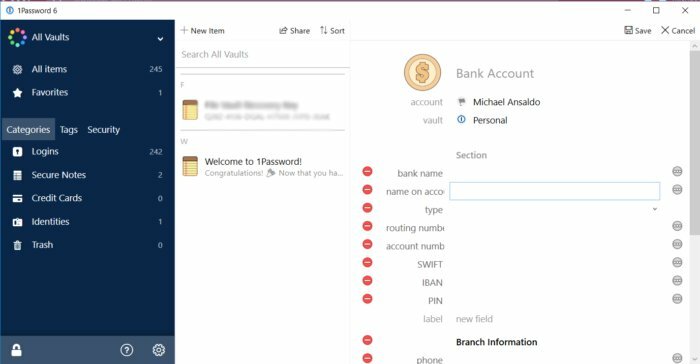 1Password’s vault stores your passwords as well as credit card info, personal profiles, and secure notes. 1Password saves your login credentials when you first visit a site, but it won’t automatically display them when you return. Instead you must click the browser button to see a list of available logins for that site and select the right one or press Ctrl + backslash to bring it up. All your login data is saved and displayed in a list in your vault. You can edit individual entries and organize them into groups using tags. 1Password will check your vault for weak passwords, but it doesn’t offer much detailed evaluation. 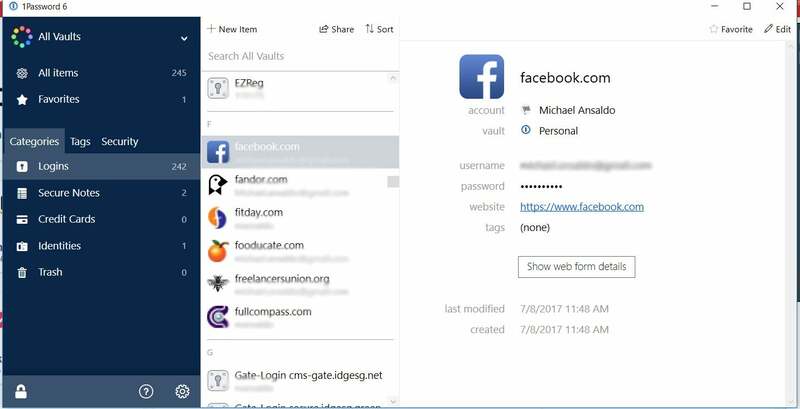 The password generator, accessed from the browser extension, offers more customization options than most password managers. It defaults to 20-character passwords, but you can scale it anywhere from four to 54 characters using a slider. Passwords automatically use both upper- and lower-case letters, and you can include from one to 10 symbols and characters. Alternately, you can create a passphrase of three to 10 words with a choice of separators including hyphens, periods, or commas. Sadly, 1Password doesn’t let you automatically update passwords though. 1Password can store credit cards, bank accounts, and other profile data for auto-filling web forms. 1Password lets you store identity profiles and credit card information for filling in web forms. As with passwords, however, it doesn’t do this automatically. You have to right-click in a form field and choose the profile you want to use from a menu. 1Password also provides secure notes in which you can store sensitive documents and data like bank account and password numbers. Pricing starts at $35.88 a year for a single user and allows you to use 1Password across all your devices. A family plan, which is required to share passwords, is $59.88 a year and covers up to five people. Both plans include a free 30-day trial. 1Password is a capable password manager, but it’s lack of automation, even if it’s for security reasons, is disappointing considering that’s one of the very features for which these tools are prized. If you’re new to password mangers, the involved installation can be daunting, too. 1Password is worth considering in your quest to find the right password manager for your needs, but we recommend trying something simpler like LastPass first.